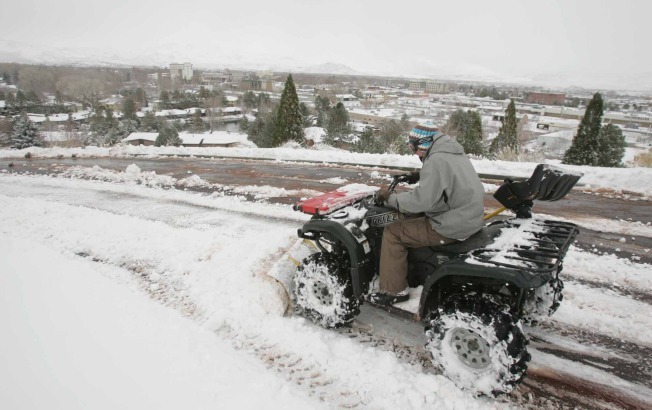 Brandon Baxter, 17, plows Thompson Street in Carson City, Nev., on Thursday. RENO, Nev. – As much of the country awoke to a welcome reprieve from heavy snowfall and ice-slickened roads, a new winter storm in the West snarled holiday traffic and darkened lights on Christmas trees in thousands of homes Thursday. In the Sierra Nevada, heavy snow and whiteout conditions led police to shut down an 80-mile stretch of Interstate 80 for several hours on Christmas between the California-Nevada line and Applegate, Calif. The state Highway Patrol cautioned drivers to be prepared for slow going. About 10,000 Salt Lake City-area residents were left without electricity to light Christmas trees Thursday morning after nearly a foot of snow fell in the midst of frigid temperatures. Utilities managed to restore power within the hour. The Utah snowstorm prompted winter storm warnings across western Colorado and a blizzard warning in the southwestern corner of the state. "It's going to be a heck of a storm," said Chris Cuoco, senior forecaster for the National Weather Service's Grand Junction office. "We're expecting significant snowfall in all the mountains of Colorado. Even the valleys are going to see 4-plus inches of snow." Up to 20 inches of snow was forecast for parts of southwestern Colorado overnight, along with wind gusts of up to 80 mph. The mountains around Lake Tahoe were blanketed by about 2 feet of snow, bringing totals at some resorts in the past two weeks to 10 feet. "This is one of the snowiest Christmas holiday periods I can remember," said Homewood Mountain Resort general manager Kent Hoopingarner. That snow proved deadly for at least one skier Thursday, as an avalanche killed a 21-year-old man at the Squaw Valley ski resort in California. A pair of skiers at the Mount Rose ski resort south of Reno, Nev., went missing Thursday afternoon. The Washoe County sheriff's office said they had been in contact with the duo by cell phone, but concerns grew as temperatures plummeted to single digits and winds increased by nightfall. In the upper Northwest, hammered by storms over the past week, the weight of snow, ice and water collapsed the roof of Capital High School early Thursday in Olympia, Wash. Assistant Fire Chief Greg Wright estimated that more than 2,500 square feet of roof fell into the building. No one was injured. Spokane broke a record Thursday for most snowfall in the month of December. As of 4 p.m., Spokane had received 46.2 inches of snow, smashing the previous record of 42.7 inches set in 1996, said Laurie Nisbet of the National Weather Service. In Michigan, slick roads were blamed for a head-on crash that killed two women and critically injured a man Thursday near Farwell. In New Jersey, a 40-foot tree fell on the car of a Massachusetts family headed to a Christmas celebration early Thursday, killing a grandmother and her son and injuring the man's two young daughters. Authorities were still trying to determine what caused the tree to fall but said winds in the area were blowing about 40 mph at the time of the accident. Winds gusting to more than 30 mph blacked out thousands of homes and businesses on Christmas in New Hampshire, two weeks to the day after a devastating ice storm knocked out power across much of the region. The utilities Unitil and Public Service Co. of New Hampshire said the outages affected more than 100 communities. Nearly a dozen flights were canceled Thursday at O'Hare, but no delays were reported, the aviation department said.